The McKinley Dog Park Advisory Council is bringing the first dog park to the southwest side of Chicago in 2019. We've been working on this project since the summer of 2014 and look forward to this key community amenity for pet lovers in the neighborhood and beyond. Get in touch with the council by emailing us at mckinleydogpark@gmail.com, visiting our website at mckinleydogpark.org or joining us at one of our upcoming meetings and events. 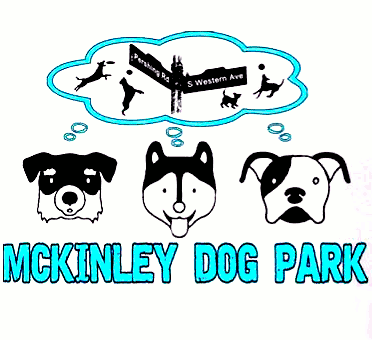 The McKinley Dog Park Advisory Council is a group of individuals from the McKinley Park area who are interested in starting a safe, legal Dog Friendly Area in Chicago's iconic McKinley Park, which rests on nearly 70 acres of Chicago's South Side, on Pershing between Western and Damen. If you are interested in joining the committee and playing a role in the fundraising for and development of a dog park, please email mckinleydogpark@gmail.com . We want to create a beautiful, well-maintained space open to all dog lovers and friends who will be willing to uphold the park’s rules and restrictions. We aim for this dog park to be a community project, supported in large part by volunteer dog advocates and maintained in partnership with the Chicago Park District. There are currently zero dog parks south of 15th Street. There are no public dog parks in our area to accommodate safe, off-leash dog activities. Such a park would allow families with dogs to spend more quality time with their pets. It would reduce angst between dog owners, non-owners, police and park authorities regarding dog access to other city parks. This park would increase opportunities for residents to interact with their neighbors and help create a sense of community. Regular exercise is great for any dog's longevity and weight control, and the overall effect of regular exercise makes most dogs calmer and better behaved. If you would like to be involved in our efforts, you can email mckinleydogpark@gmail.com.